The Texas Higher Education Coordinating Board (THECB) and UTA host the first comprehensive regional gathering of North Texas leaders to discuss how all parties will work together to meet the state of Texas’s 60x30TX goals. 60X30TX: Access, Success, Texas will be held 8 a.m.-2:30 p.m. Tuesday, April 5, at College Park Center. Register online by Tuesday, March 29. In order to meet the workforce demands and intellectual capital expectations of the next generations of Texans, the THECB issued a statewide educational goal calling for 60 percent of adults aged 25 to 34 to hold college degrees or certificates by 2030. Speakers include Raymund Paredes, commissioner, THECB; Kati Haycock, CEO of The Education Trust; and UTA President Vistasp Karbhari. Read more about the 60X30TX Conference. Some students, faculty, and staff will need to move their vehicles in preparation for Jane Goodall's appearance for the Maverick Speakers Series on Thursday, March 31. Individuals parked in College Park South, Central, and North garages and parking lot 47 in front of the Business Building will need to move their vehicles by noon Thursday to avoid being cited or towed. Residents of The Lofts, Vandergriff Hall, Arlington Hall, and Brazos Hall also must move their vehicles. Lots 49, 50, 51, and 52 will be available. A shuttle service will be provided the day before, the night of, and the day after the event between College Park Center and those lots. Dr. Goodall, a primatologist and conservationist, will speak at 7:30 p.m. in College Park Center. Tickets for "Gombe and Beyond: An Evening with Dr. Jane Goodall" are sold out. Potential candidates for student representatives need to file by Thursday, March 31. Applications are available in the Student Congress Office, Suite B150, of the E.H. Hereford University Center. 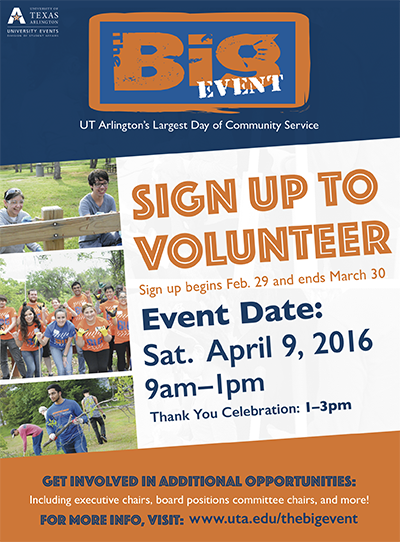 For details, contact Jennifer Fox at jdfox@uta.edu. 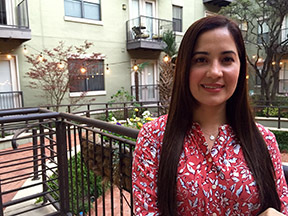 UTA’s landmark University Crossroads promotes college access and readiness and annually impacts more than 30,000 low- to moderate-income students, such as recent graduate Giselly Cobas-Rincon. University Crossroads offers free SAT preparation classes, financial aid and literacy workshops, parent programs, and advising. Students organizations and University departments can share info on programs and services at the Orientation Involvement Fair and the annual Block Party. The next Involvement Fair is at the New Maverick Orientation for transfer students Thursday, April 14. 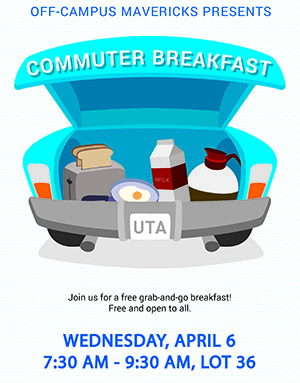 Visit www.uta.edu/sao to register and for details. 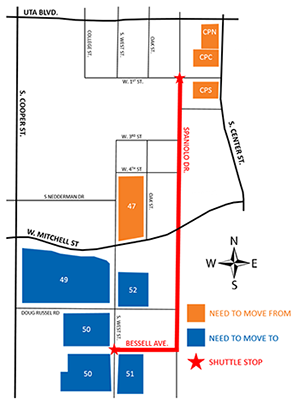 The Block Party is set for 6-10 p.m. Thursday, April 28, on Spaniolo Drive by College Park Center. Register for a booth by Friday, April 8. Also, register to volunteer. The sale will run from 8 a.m. Monday, April 11, through midnight Friday, April 15, on the UT Press website. Artists will fire up the furnace and fuse together melted glass and brilliant color at the annual Glass Art Sale and Show on Saturday, April 2, at the Studio Arts Center, 810 S. Davis St. Hundreds of items delicately handcrafted by students and staff in the Department of Art and Art History's glass art program will be available to the public at a fraction of the cost of similar items in professional art galleries. 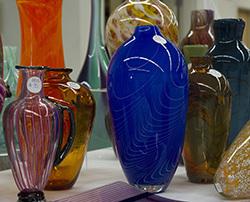 Prices for the vases, paperweights, platters and other art pieces range from $5 into the thousands. The sale runs 8 a.m.-5 p.m. or earlier if items sell out quickly. A silent auction will take place at 2 p.m., with bids taken 9 a.m.-1 p.m., also at the Studio Arts Center. Another popular feature includes live demonstrations of glass-casting, glass-blowing, and other techniques used to make the art. Read more about the Glass Art Sale and Show. Spirit Week Social Media Challenge, all week; tailgate and baseball game, Tuesday, March 29; Mavs Take Over: Grease Monkey and Trivia Night, Wednesday, March 30; canned food drive, Thursday March 31; pep rally, Friday, April 1. UTA Ambassadors. Film Screening: 'The Head of Joaquin Murrieta' Filmmaker John Valadez goes on a quest for the remains of Joaquin Murrieta, a legendary Mexican outlaw who was killed by bounty hunters in 1853 and had his head placed in a jar for public display across California. Free. 3 p.m., Room 148, Fine Arts Building. Center for Mexican American Studies. Baseball Mavericks vs. TCU. Tickets $5, $3 students. 6:30 p.m., Clay Gould Ballpark. Also, vs. Louisiana-Monroe, 6:30 p.m. Friday, April 8; 2 p.m. Saturday, April 9; and 1 p.m. Sunday, April 10. Athletics. Double Bass Studio Recital Free. 7:30 p.m., Irons Recital Hall, Fine Arts Building. Music. Men’s Tennis Mavericks vs. SMU. 2 p.m., UTA Tennis Center. Athletics. Faculty Double Bass Recital with Jack Unzicker Free. 7:30 p.m., Irons Recital Hall, Fine Arts Building. Music. Maverick Speakers Series "Gombe and Beyond: An Evening with Dr. Jane Goodall." SOLD OUT. 7:30 p.m., College Park Center. Maverick Speakers Series. Softball Mavericks vs. Appalachian State. 1 and 3 p.m., Allan Saxe Field. Also, noon Sunday, April 3. Athletics. International Week: Soccer Tournaments Soccer tournaments. 10 a.m.-3 p.m., Fields Complex. International Education. Women's Tennis Mavericks vs. UT-San Antonio. 11 a.m., UTA Tennis Center. Also, vs. Memphis. 11 a.m. Sunday, April 3, and vs. SMU, Thursday, April 7. Athletics. International Week: Parade of Banners Traditional parade of banners from E.H. Hereford University Center to the library mall for speakers and activities. 12:15-1 p.m. Office of International Education. International Week: Food Fair A delicious International Week tradition. 11 a.m.-3 p.m., University Center mall. Office of International Education. Tail Waggin’ Wednesday Students, faculty, and staff can take a break filled with unconditional love from registered therapy dogs. Free. 10 a.m.-2 p.m., sixth floor, Central Library. UTA Libraries. International Week: Fashion Show Free. 7-9 p.m., Bluebonnet Ballroom, E.H. Hereford University Center. Office of International Education. International Week: Global Extravaganza An international talent show. Free. 7-9 p.m., Bluebonnet Ballroom, E.H. Hereford University Center. Office of International Education. Earth Day 11 a.m.-1 p.m. Tuesday, April 12, University Center mall. Institute of Sustainability and Global Impact. Baseball Mavericks vs. Houston Baptist. 6:30 p.m. Tuesday, April 12; vs. Georgia Southern, 6:30 p.m. Friday, April 15, 2 p.m. Saturday, April 16, and noon, Sunday, April 17; vs. Dallas Baptist. 6:30 p.m. Tuesday, April 19; and vs. Louisiana-Lafayette. 6:30 p.m. Friday, April 29. Tickets $5, $3 students. All at Clay Gould Ballpark. Athletics. Softball Mavericks vs. Louisiana-Monroe. Tickets $5-7, $3 students. 1 and 3 p.m., Saturday, April 16, and noon, Sunday, April 17; vs. Troy. 1 and 3 p.m. Saturday, April 30. All at Allan Saxe Field. Athletics. Men’s Tennis Mavericks vs. Midwestern State. Free. 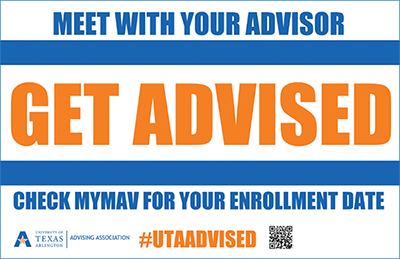 2 p.m. Saturday, April 16, UTA Tennis Center. Athletics. Maverick Film Festival The competition features four-minute films by students. 7 p.m. Friday, April 22, Rosebud Theatre, E.H. Hereford University Center. Art and Art History. Gallery 76102 'The More I Build You' Within paintings and drawings, artist Layla Luna constructs and deconstructs spaces and architectural structures. Gallery hours noon-6 p.m. Wednesdays-Saturdays, Fort Worth Center, 1401 Jones St., Fort Worth. Through March 31. Gallery 76102. GIS Workshop Explore the geographic information system (GIS) and its applications in research and teaching and the most commonly used GIS software including ArcGIS, Google Earth, and AutoCAD MAP 3-D. Learn how to obtain some GIS software free under an educational license. Free. 11 a.m.-1 p.m., sixth floor parlor, Central Library. UTA Libraries. Women's History Month Lectures Frances Smith Foster, Emory University, Kitchens, Attics, and Autobiography. Noon-1 p.m., sixth floor parlor, Central Library. Women's and Gender Studies. Anderson Sports Performance Lecture Fred Williams, head coach, WNBA Dallas Wings, Quick Tips and Drills. Noon, Lone Star Auditorium, Maverick Activities Center. Kinesiology. Technology StartUp Lunch-n-Learn George Kondraske, right, professor of electrical engineering and chair of the Research Conflict of Interest Committee, on how to identify a potential research conflict of interest, why it is necessary to manage conflicts of interest, and what should be in a COI management plan. For faculty and graduate students. Lunch provided. RSVP to startup@uta.edu or 817-272-1140. 11:45 a.m., StartUp Lounge, Campus Center, by the Nanotech Building. Office of Technology Management. TEDxUTA A program of live speakers and video to spark deep discussion and connection in a small group. Tickets $20 students; $30 faculty, staff; $40 general public. 1 p.m., Rosebud Theatre, E.H Hereford University Center. TEDxUTA, EXCEL Campus Activities. Film Screening: 'Escalation' A 90-minute film-based workshop that educates about relationship violence and empowers you to work for change. A discussion follows. Resources, activities, snacks, and drinks provided; T-shirt giveaways. 7:30 p.m., Maverick Activities Center. Relationship Violence and Sexual Assault Prevention. Arlington Technology Association Arlington Mayor Jeff Williams describes areas he believes are prime collaborative opportunities that would be beneficial to both the city and UTA. RSVP. Free. 7-8 a.m., Room 100, Nedderman Hall. Arlington Technology Association. Technology Startup Seminar Silicon Valley investment group Artiman Ventures brainstorms with faculty, students, and local entrepreneurs on how to help move new technologies to the marketplace. 2-5 p.m., Lone Star Auditorium, Maverick Activities Center. Also, small group meetings and follow-up sessions, Friday, April 8, StartUp Lounge. Read more. Research Administration. CPR/AED/First Aid Class A single, five-hour class covering the American Red Cross first aid basics, medical and environmental emergencies, adult CPR, and AED use. Registration at MAC Services and Information desk. $50. 10 a.m.-3 p.m., Room 223, Maverick Activities Center. Also, Saturday, May 21. Campus Recreation. RAD Self Defense Class Self-defense course for female faculty, staff, and students. Register online. Free. 9 a.m.-6 p.m., Room 102-B, Maverick Activities Center. UTA Police. Art Lecture Mohamed Keshavjee of the Institute of Ismaili Studies in London, author of Into That Heaven of Freedom: The Impact of Apartheid on an Indian Family’s Diasporic History. 5 p.m. Monday, April 18, auditorium, Architecture Building. Art and Art History. The Bobby Lane Invitational returned after a two-year hiatus with performances from UTA's track and field athletes at Maverick Stadium. Individual win came courtesy of Roland Sales in the men's high jump. For the women, the 4x400 meter relay team of Taylor Davis, Shaniece Prevot, Dasia Rolfe and Tamerah Gorham was victorious. Baseball Mavericks completed a series sweep over Incarnate Word 13-0 Saturday. The Mavericks play TCU at 6:30 p.m. today, Tuesday, March 29, at Clay Gould Ballpark. Women’s tennis opened Sun Belt Conference play last weekend with a sweep over Arkansas State and Louisiana-Lafayette. The Mavs return to nonconference play Thursday, March 31, at Wichita State. UTA softball fell 7-2 to Georgia Southern on Saturday. The Mavs host Appalachian State for a three-game series Friday-Saturday, April 2-3, at Allan Saxe Field. Sophomore Erick Neal was named to the National Association of Basketball Coaches 2015-16 District 24 Second Team. He is a Sun Belt First Team All-Conference selection. UTA student-athletes earned their third win Sun Belt Conference's Monthly Community Service Award for February. UTA also won award in November and December. Maverick men’s basketball ended with Thursday night's 63-60 loss to New Jersey Institute of Technology in the CollegeInsider.com Tournament quarterfinals at in Newark, N.J. The Mavericks finished the season 24-11, recording their first postseason win in last week's CIT first round. Upcoming intramural sports deadlines are badminton doubles, Friday, April 1; table tennis, Thursday, April 21; wheelchair football, Monday, April 25; battleship, Monday, May 2; FIFA video game, Wednesday, May 4; and poker tournament, Thursday, May 5.